Being a famous eCommerce platform Magento has a good number of users among which you can find such popular brands as Samsung, Vizio, Nike etc. Despite these great names Magento is open for any type of online business and whether it is of medium or large size doesn’t play a specific role. The only demand for a user is to have a good hosting service. Nevertheless, such an inevitable process of any online-store launching as a website designing can turn out to be a real perplexing question, though everything depends on the store size and its budget. Not everyone can afford a professional team of web designers and here comes a necessity to find other solutions. A popular alternative to spending a pretty penny on a web designing is a use of free design resources. We are talking about the free themes and templates, any Magento client can make use of, taking into account the type of a store and its product peculiarities. Obviously, a free template won’t provide you with something supernatural or prodigious but it can be a real money-saving decision, especially for beginners. Now we offer you to get acquainted with the best Magento themes of 2016 and probably find something special for your online store, or at least get inspired by them. In spite of its simplicity this theme is still a popular choice among Magento users. Trex is a universal option for online-shops of different sizes. You can choose a color spectrum from 5 offered options. As to the site structure, it includes all the elements which are necessary for an efficient online-shop functioning – site search, newsletter subscription, four-column footer and banners on the homepage. While product pages have slick design, product zoom feels primitive. Trex makes a maximum use of its simple structure which is easy to understand and to use for both you and your customers. To check the live demo, follow the link. This responsive theme, designed by TemplateMonster, is compatible with Magento 1.9.x. Its layout has a minimal and clean design. The navigation of Fit Body has got a customizable fixed mega menu which makes it easy for a customer to find a desired item. Besides, you can add there banners or links to the categories and the most crucial website pages. The footer is also large and consists of five links columns and custom text blocks. There are four languages supported – English, German, Spanish and Russian. The background images, enhanced with a distinct parallax scrolling effect, make the general homepage look attractive. Moreover, due to the color spectrum which involves rich colors of blue and green hues, the general view of the theme is fresh and suits the sports stores. Check out the live demo and see if this free Magento theme could work for you. Similarly to Trex theme, Cycling theme is tailored to sell sports goods. Its design isn’t overcomplicated and offers a simple website structure. Cycling has clear category and product page design but it lacks additional functionality like related products. To check the demo version of Magento classic follow the link. We couldn’t but include into our list this elegant theme with a responsive design. Access Shop Lite theme is a smart choice for online-shops with different products. Thanks to the light design its usability seems to be even easier than it is. Access Shop has got several page layouts, so a customer won’t get bored looking at the same picture on your homepage. It also has a space for promoting banners. This theme is well-compatible with all popular browsers, devices and its platforms. Moreover, Access shop is friendly with its users – several language options can prove it. Besides, every customer can create an account and get his/her own whish list which can be filled with all desired items. Here you check its demo version. 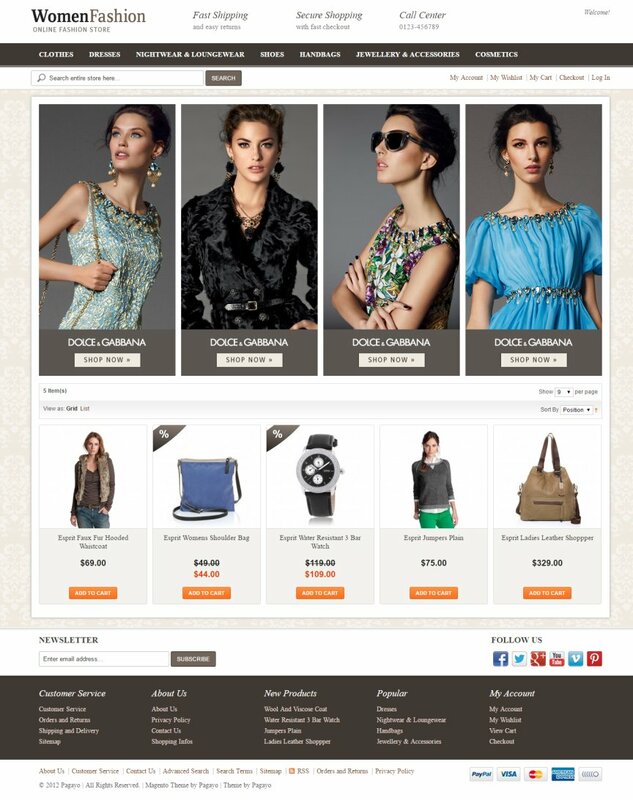 Another good free template for Magento-based shops is free theme Women Fashion by Pagayo. As you could get it from the name, this template is aimed at online-stores specialized in fashion industry. This theme offers a nice site structure with a cross-browser support and compatibility with popular devices. Its homepage has a range of promoting blocks and its footer consists of 5 linksblocks. Women Fashion product pages are rather informative and also have a product zoom, review option and social sharing buttons. You can check its live demo following the link. Though this theme is not aimed at the world of fashion, its design has its own high-tech charm. 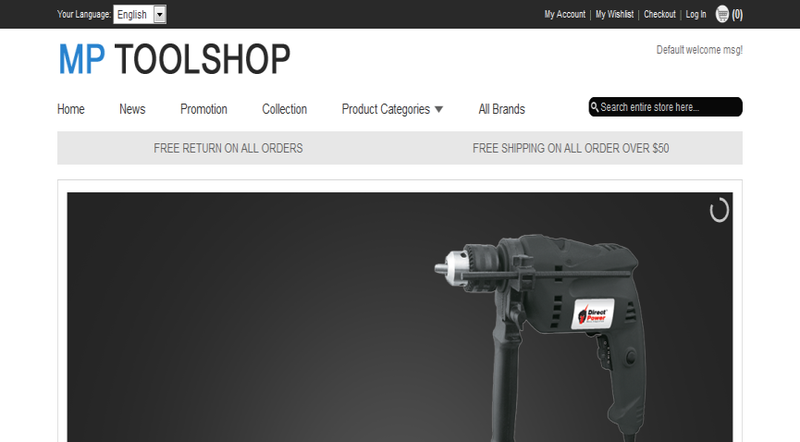 MP Tool Shop has a cool slider on its homepage which instantly tells you what stuff are sold in this online-store. Like Women Fashion, it also has product zoom and review option, though you won’t find any social sharing buttons. Instead you can use an email-to-friend option. MP Tool Shop has footer with just 3 linksblocks, and on its homepage you can see a brand block. Follow this link to try its demo version. This responsive free Magento theme is designed in light colors which make your online-store look fresh and light. This template has a homepage with a slideshow, a banner zone and four-column footer. The menu is very extensive, rich and with nice animation. TitanyShop theme also supports several languages and has a currency choice option. Besides, there is an option of mini cart preview what is very convenient. To check the live demo, follow the link. Another good free Magento template is Ves Shoppy. This theme has Ves mega menu and other Ves theme settings. This theme has got not only a responsive design but also a multilingual site structure. Such features as Ajax Add to Cart, Quick view product, Color swatches, promoting banners and brands block are also available. You can find there back to top and social sharing buttons, too. As to the menu type, it’s a drop-down one. You can try Ves Shoppy live demo here. Obviously, users of Magento platform are offered a good assortment of themes to any taste and demand, and this list is just a part of it.